Functional medicine encompasses a dynamic approach to assessing, preventing and treating complex chronic disease. It helps clinicians of all disciplines identify and ameliorate dysfunctions in the physiology and biochemistry of the human body as a primary method of improving patient health. Functional medicine is a systems based medicine that is based upon discovering the reason(s) why someone has the symptoms they experience rather than just treating or suppressing those symptoms. We go upstream to find out what the antecedents, triggers and mediators are that are causing the symptoms the patient is experiencing. More often than not patients’ seemingly unrelated symptoms such as digestive issues and thyroid problems are all connected. Again fatigue and joint pain may seem unrelated but with functional medicine we piece the puzzle together to demonstrate how all of these symptoms can be alleviated if we take an integrated approach. This model of practice emphasises that chronic disease is almost always preceded by a period of declining function in one or more of the body’s physiological organising systems. Returning patients to health requires reversing (or substantially improving) the specific dysfunctions that contributed to the disease state. Those dysfunctions of each of us, the result of lifelong interactions among our environment, our lifestyle choices and our genetic predispositions. Each patient therefore represents a unique complex and interwoven set of influences on intrinsic functionality that over time set the stage for the development of disease and the maintenance of health. To manage the complexity inherent in this approach, functional medicine has adopted practical models for obtaining and evaluating clinical information that leads to individualised patient centred therapies. One way to illustrate where functional medicine falls in the continuum of health and healthcare is to examine the functional “medicine tree” shown below. 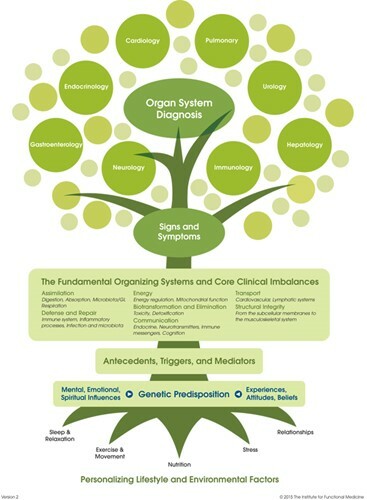 In its approach to complex chronic disease functional medicine encompasses the whole domain represented by the graphic shown below, the first addresses the patient’s core clinical imbalances, the fundamental lifestyle factors that contribute to chronic disease and the antecedents triggers mediators that initiate and maintain the disease state. Prognosis of course, is part of the functional medicine model but the emphasis is on understanding and improving the functional core of the human being as the starting point for intervention. Put simply, the functional medicine practitioner will ensure that all routes to wellness are addressed with the patient. This will normally involve strengthening the immune system, decreasing toxicity, normalising inflammatory function, optimising metabolic function, balancing regulatory systems, enhancing regeneration, helping people to live in harmony with their life force and nature. What is a functional medicine practitioner/doctor? Functional medicine practitioners focus on restoring balance to the dysfunctional systems by strengthening the fundamental physiologic processes that underlie them and by adjusting environmental and lifestyle inputs to nurture or impair them. This approach leads to therapies that focus on restoring health and function rather than simply controlling signs and symptoms. Functional medicine at the London Clinic of Nutrition has helped many patients and with the breadth of experience of the team, there is little we have not seen or helped people with. We specialise in Lyme disease, autoimmune disease, gut health, hormone health and unexplained illness. There are too many success stories to mention but some of these can be seen on our Google reviews and testimonials. Before finding functional medicine I was already practising integrated naturopathic medicine in London, so learning functional medicine just added a bit of a gloss to my practice. What I would say though is that using the functional medicine model it has helped me understand that to get better results with my patients, I need to heal myself on all levels and develop love for all humanity and by doing so can inspire others and provide hope. We can help you with your health by acknowledging our greatest health threats now arise from how we live, work, eat, play, and movement. Ultimately the best we can help you as your London functional medicine practitioner is by educating you about healthy lifestyle practices and being an information resource to you that is not driven by propaganda, bias or vested interests.